Forget the milled natural grain is the way to go 100% and let us do the rest re the patina. Shawn Ali and alanart like this. This milled or impressed patterning is mainly for wallets and handbags to make them look more expensive but never on an A2. The current G1 is cowhide milled to make it look like goatskin ,but as I said before the natural leather top is the way to go . We can then cover the tanning over tanning to reveal a lighter color underneath as it wears similar to how jeans get whiskers . 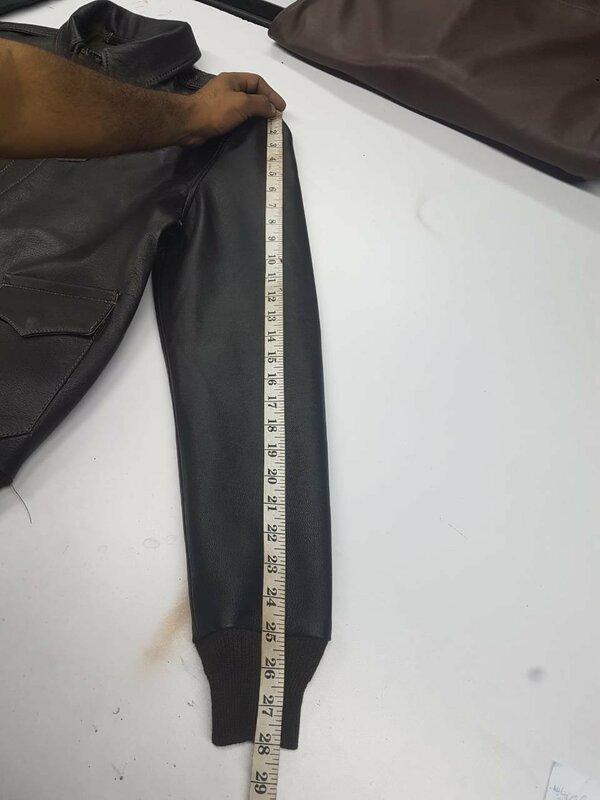 One step at a time you have the cut , label and the quality under control concentrate on the leather . SHOW US MORE EXAMPLES AND WE WILL CHIME IN ,we can be your R&D department . 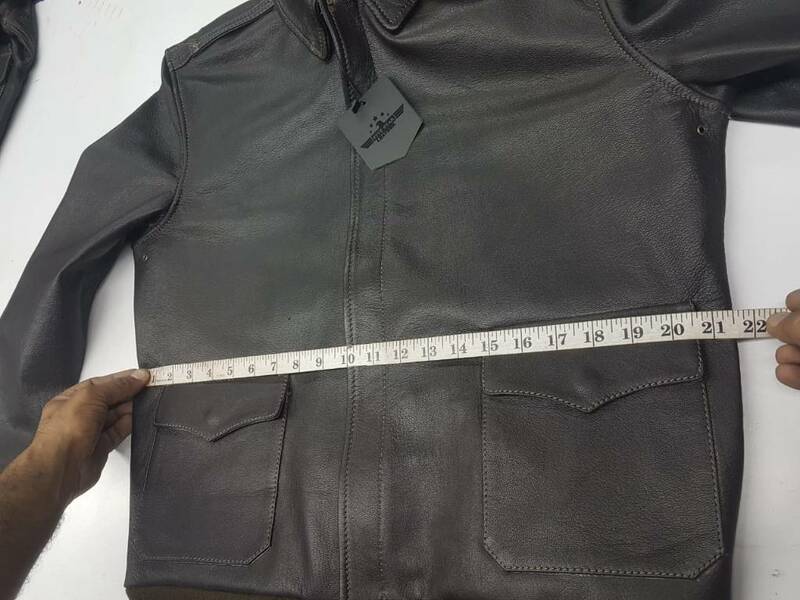 If you have people in your company who ride motorcycles they should be given a jacket so you can see the character develop . Shawn Ali, Earloffunk and alanart like this. I agree. Stay away from embossing. Shawn Ali and Earloffunk like this. I look forward to seeing a nice russet horsehide Bronco in the future and attach a few photos of an original for colour reference and detailing. Broncos had crown zippers but also talon with the stitching in olive green thread I believe. Here she is. Fits just as I tend to like (roomy) and a great jacket built just to my specs. Chemical smell is actually there, but I have it out getting some air. I suspect it is the plastic it's wrapped in and it seems to be going away right away. Thanks Shawn. I think the jacket looks great!! 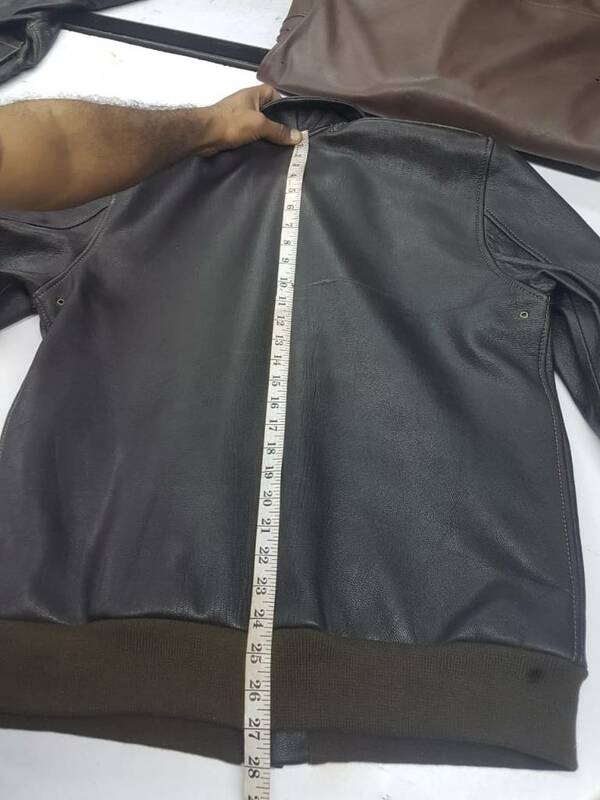 I'm actually interested myself in ordering such a jacket from @Shawn Ali , as the previous jackets I've ordered from Shawn and Fivestar Leather have been excellent! What I'm mainly wondering about is the width or length of the two horizontal chest zippers, especially when viewing the pictures of the jacket in the Ebay ad where the jacket is pictured flat and stretched out. I perceive the zippers to be smaller than other Hartman jacket's zippers (e.g. ELC's Hartmann), but maybe I'm wrong? 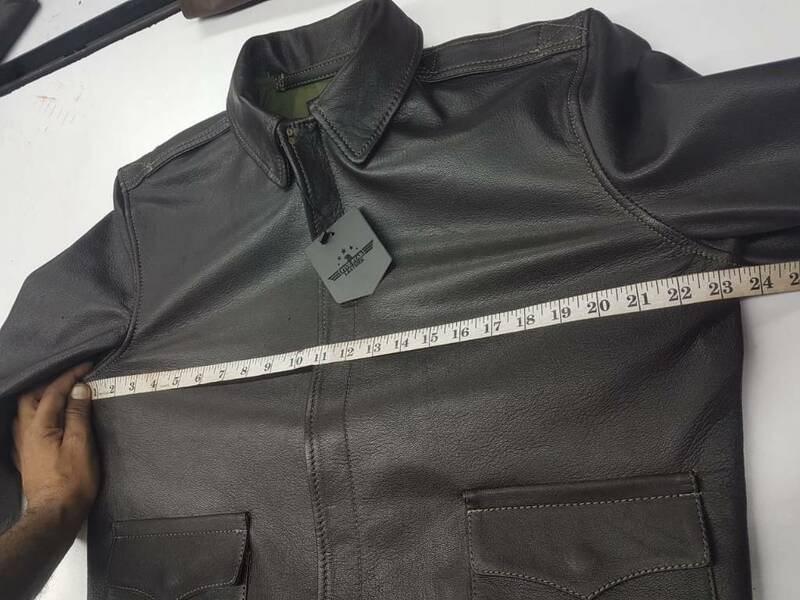 Does anyone know approximately the measurements of the original Hartmann jacket's zippers? Or other repro manufacturers' versions like ELC's? Nickb123 and Shawn Ali like this. Shawn just send me a pic of my A2 while its construction...I already love it ! Flightengineer, Thomas Koehle, Shawn Ali and 4 others like this. Looking good. I like the olive green liner and thread... Fit pics when you receive it please. Shawn Ali and Bombing IP like this. Any chance of seeing the finished product when it’s done ? Flightengineer, Kennyz, Shawn Ali and 1 other person like this. Black or almost, with green lining?? 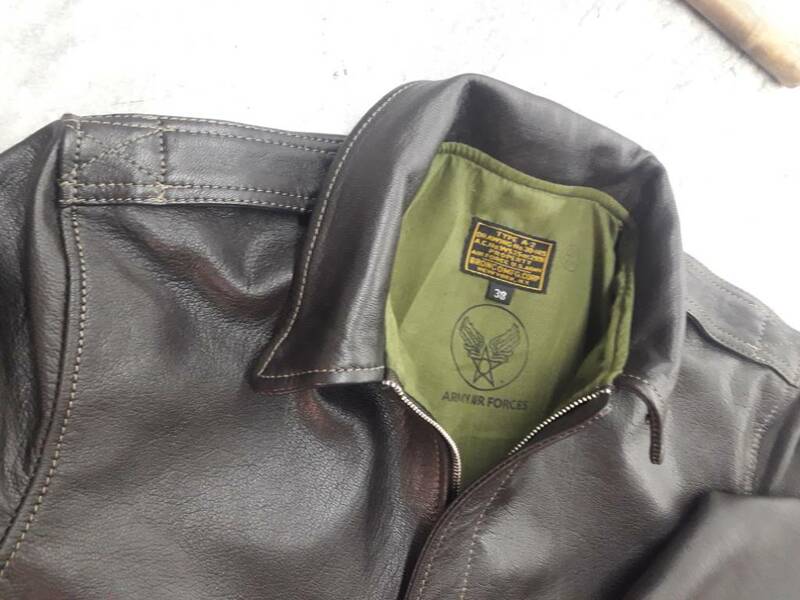 Stitching on epaulet looks a bit iffy and the collar 'roll' looks too thick plus it's pulling across the chest with collar studs done up, what's going on? Sorry not wishing to offend just my observations but I don't consider that an A2 repro, more a lookie-likie!! Shawn Ali and Steve27752 like this. Not for me, but enjoy your jacket. Shawn Ali and Brettafett like this. It's a seal brown one. jack31916, dinomartino1, Thomas Koehle and 2 others like this. But at 150 Euros!!!! Shawn NEEDS to get a WW2 original A-2 to take apart, study and then copy himself... Iron out some details, use the correct knit and then that WILL change the game. Put me on your list Shawn. Shawn Ali, alanart and Thomas Koehle like this. Just venturing an opinion here, so please don’t shoot the messenger, but isn’t this the natural progression of things. If we were to compare a first year ELC, Aero or another tier one makers’ jackets to the jackets that same company is making today, I think you’d see a fairly different product between what they made then vs now. 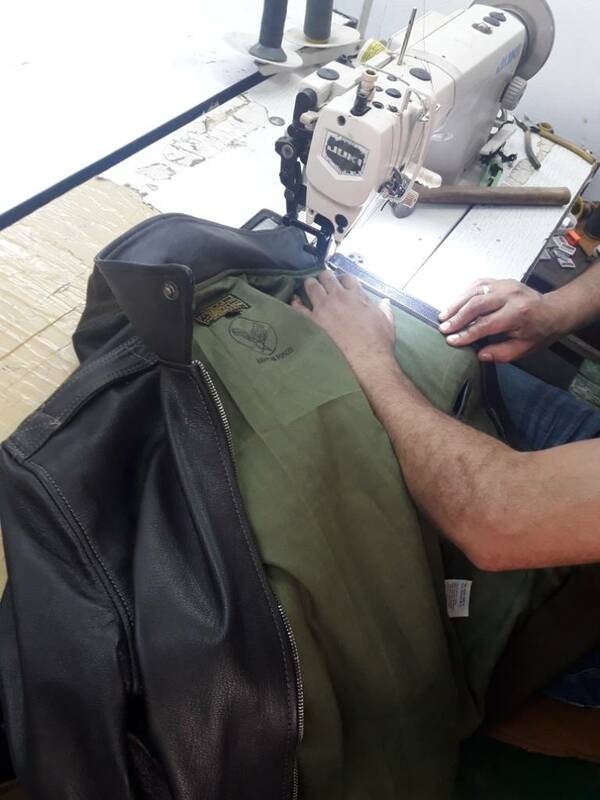 I think that in time, and with a little R&D, Shawn’s jackets will develop and eventually become competitive with well known makers jackets, but to compare his jackets to those at this stage of the game really isn’t fair . Particularly at the price he’s offering them. Once again just my opinion, but I think that we as a group sometimes can be too critical of new makers products. Often times we can wear them down to the point of one day looking around and wondering where they went. I can think of a few of them that have just disappeared , Diamond Dave, Norshor, John the fellow who was making some great Irvin Repros. So all I’m saying is, sometimes we need to consider that new makers don’t come here for our input very often and maybe we should not be too harsh on them. I’m done ...., all thoughts and opinions welcome . Shawn Ali, Monsoon, Thomas Koehle and 4 others like this. Can say exactly the same thing for the Danish crew... They are on V3 of their Bronco, continually developing, trying to improve. As a group, many of us are moaning about the exorbitant prices of top-tiers and yet when guys like this come onto the scene, trying to present a jacket, we often look at the negatives instead of the positives... And in comparing with the top-tier maker's jackets, often pulling at hairs and details (which is actually a good thing)... We forget these are 150 to sub-400 Euro jackets... Really good quality and in general, a lot cheaper, AND more WW2 original-maker 'authentic' than many other generic A-2s on the market! Shawn Ali, Lorenzol, B-Man2 and 1 other person like this. I don't think it's an exact copy of a Hartmann. More of a loose repro integrating basic features but with no detail obsession. Exact copy of a Hartmann? Are you in the wrong thread Nick123? If not then while I know I may have come across as a bit critical but it is nearer to an A2! In all seriousness guys I think you'll find prices will increase the closer you try to get nearer the real thing, a la Bill Kelso and from the pics it's still a long way off - just my honest opinion but, you get what you pay for. Norshor are still about by the way but I think Mark decided there was sufficient players in the repro market so has concentrated on just civi period jackets, check him out, some lovely pieces. Not sure about Diamond Dave, think he just disappeared from here like others as he got fed up with the way he saw this forum going at times - like many admit, it has changed, for better or worse is for the individual to decide and all going off topic I realise. Your logic is rock solid Burt. There are always growing pains. Shawn Ali, Brettafett and B-Man2 like this. Shawn Ali, B-Man2 and Brettafett like this. Flightengineer, Kennyz and Shawn Ali like this.